These baked meringue cookies are crisp, sweet, & light as a cloud! Plus, lots of tips on how to make meringue that’s stiff and fluffy as can be. I’m out of the office all day today, chaperoning my 10-year old’s class trip to Harrisburg and Hershey. So I put this post together for you yesterday. I really wanted to get it out before the end of the week! You see, I have a lot of recipes here on this site that begin with meringue. Recipes like chocolate Swiss meringue buttercream, angel food cake, and coffee macarons. It may seem pretty simple to whip egg whites and sugar together until fluffy and stiff, but it can actually be kinda tricky if you’re not sure what you’re doing. And I get a lot of questions about it! 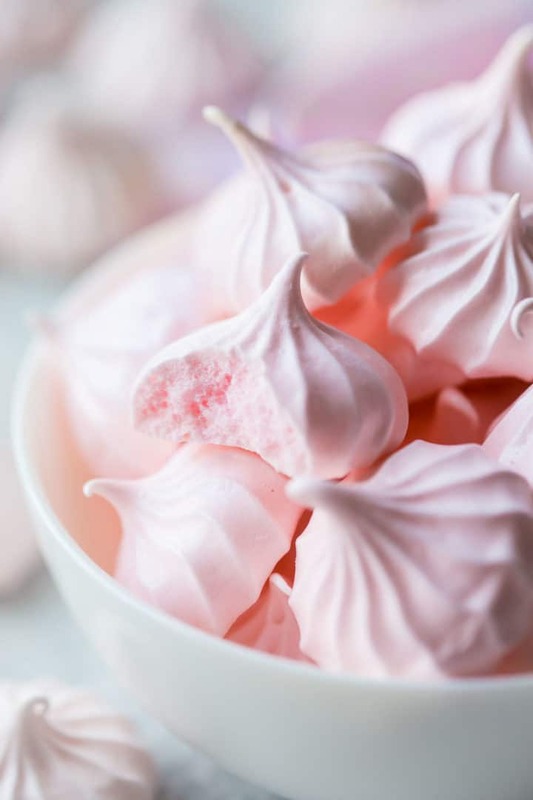 So I thought it was about time I put together a comprehensive guide for how to make meringue. 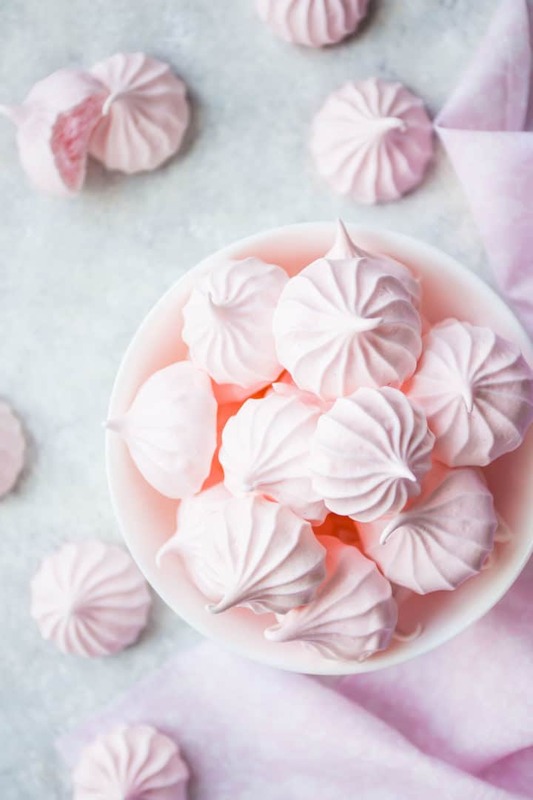 And these cutie-patootie baked meringue cookies are the perfect place to start! The overall idea of meringue is pretty simple. It’s really just egg whites and sugar whipped together until fluffy and stiff. I like to add a few other ingredients as well, such as cream of tartar to make the meringue more stable, vanilla extract, and salt to balance the flavors. If you want to make meringue without cream of tartar, just sub in a few drops of lemon juice or white vinegar. They all pretty much do the same thing. And you can get creative with flavors too. Vanilla isn’t the only option! Try adding almond extract, rosewater, lemon, or orange blossom water for example. You could even fold in freeze dried fruit (like raspberries) that’s been ground to a powder in the food processor. TIPS AND TROUBLESHOOTING: WHY WON’T MY MERINGUE STIFFEN? While the ingredients may be simple, the technique could really make or break you. Add the sugar in too early and your whites might never get fluffy enough. Add it in too late and your meringue might weep because the crystals didn’t have time to dissolve. Add it in too fast and it could deflate all the air out of the meringue. It’s a really delicate balance! But if you start adding the sugar when the whites are starting to look foamy and a little white, and keep it going in S-L-O-W-L-Y (I’m talking like 1/4 teaspoon at a time!) you should be ok.
There’s one other thing that is SO important when it comes to making meringue, and that’s to make sure that everything is SUPER clean! Make sure your bowl and your whisk are 100% free of any trace of fat. If any of your tools are at all greasy, your whites won’t whip up properly. Wash everything in very hot, soapy water and dry it well. 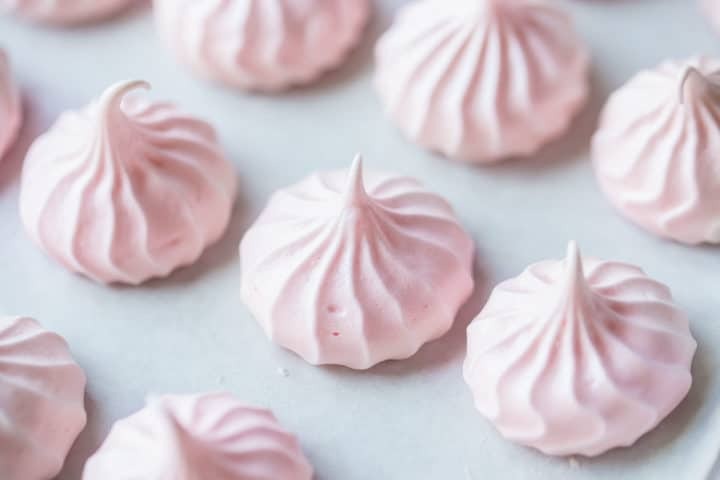 Even the most microscopic trace of fat could make it impossible for your meringue to reach that critical stiff peak stage. And do you know what contains fat? Egg yolks! So be really careful when you separate the eggs too. If you accidentally pierce the yolk you can forget about ever making a proper meringue. For these meringue cookies, we aren’t so much baking the meringue as drying it out. These bake at a really low temperature (only 200 degrees F), for a long time. This gets them nice and crisp all the way through, without browning at all. Pipe the meringue into a cup or nest shape, and it can be filled with lemon curd, berries, or ice cream. Try your hand at Pavlova– it’s baked a little faster so it remains soft and marshmallow-y inside. Top a lemon meringue pie or baked Alaska– the meringue that tops these desserts doesn’t get baked at all; instead it’s toasted with a brulee torch or under the broiler. If you can make a proper meringue, you’re halfway to making French macarons! You can also make my favorite ever frosting: Swiss meringue buttercream! CAN BAKED MERINGUES BE MADE AHEAD? You might be able to get away with baking meringues ahead, but you’d be taking a big chance. If it’s a dry day, that’s probably your best bet. But if it’s at all rainy or humid, you’re going to have trouble. They might come out of the oven just right, but over time they will re-absorb moisture from the air and become sticky. I’ve had this problem a few times before and it’s so frustrating. You will be so much better off if you make them just before you plan to serve them. 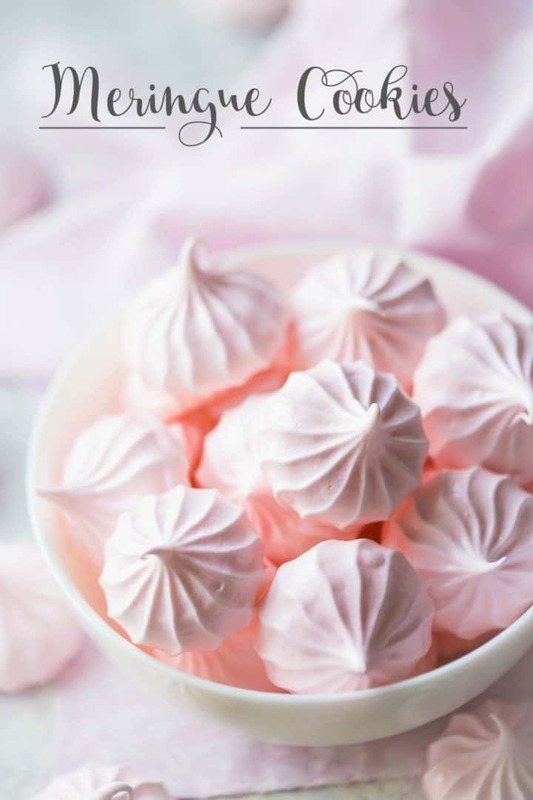 If you live in a really dry environment, and you want to take your chances, place the meringue cookies in an airtight container and seal it tightly to keep the humidity out. They can last for a few days at room temp without spoiling, but they may become a bit sticky. Hopefully this info will come in useful for you the next time you need to make a meringue-based confection! And if you have a question I didn’t cover here, feel free to leave it in a comment below, and I’ll get back to you with an answer as soon as I can. These baked meringue cookies are crisp, sweet, & light as a cloud! Plus, lots of tips on how to make meringue that's stiff and fluffy as can be. Place the egg whites in a large, clean mixing bowl, and add the cream of tartar and salt. Whip the whites on medium speed until foamy and just beginning to turn white. While continuing to whip, add in the sugar very slowly (about 1/4 teaspoon at a time). When all the sugar has been added, turn the mixer up to high speed and whip until the meringue is glossy and very stiff. Stir in the vanilla extract, then fold in the color (if using). Transfer the meringue to a clean piping bag fitted with a French star tip, and pipe 1-inch diameter kisses onto a parchment-lined baking sheet. 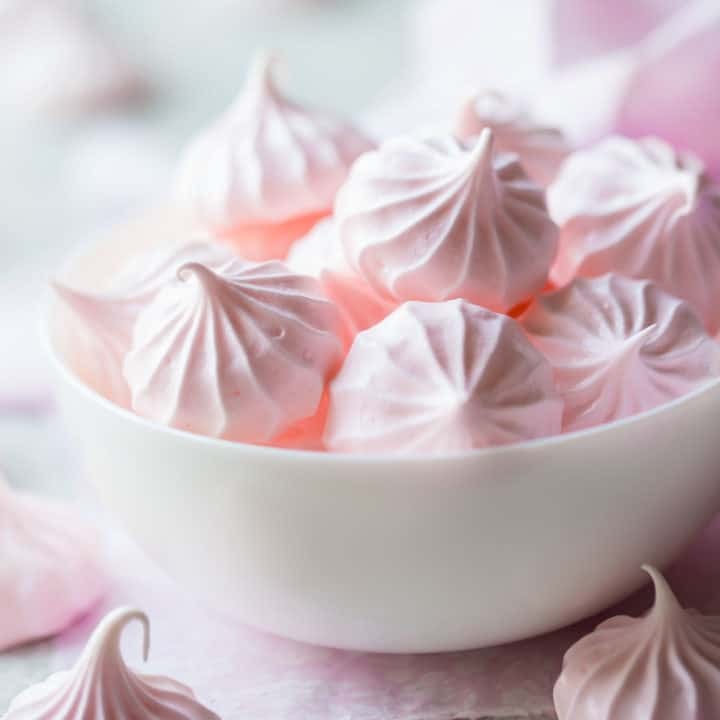 Dry the meringues in the warm oven for 2 to 2 1/2 hours, or until light and crisp (do not brown). *A few drops of lemon juice or white vinegar can be substituted. **Other types of extracts can be substituted to taste. Do you think that if I cut out some sugar the meringue texture will be affected? Yes it definitely would. The meringue will be less glossy and will have a different kind of texture. Not sure I understand your question, could you elaborate?